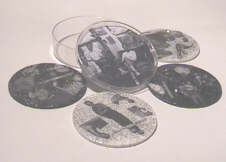 Four individual collaged plexiglass discs--one for each band member--glittered and covered with durable polymer resin. Hand-cut collage insert in plexiglass boxtop. Plastic comb, template and ruler with inscription. Copyright © 1997-2008 Abaton Book Company. All rights reserved.